Interstate 74 & U.S. 421 westbound overhead posted at the Mohrwood Road northbound on-ramp to Indianapolis. The interchange between Mohrwood Road / County Road 800 West lies at the tri-corner of Decatur, Rush and Shelby Counties. The freeway mainline does not formally enter Rush County however. Photo taken November 4, 2011. Interstate 74 crosses Indiana from the northwest to the southeast across the central part of Indiana. The highway receives less traffic than the cross-country Interstate 70 and remains four-lanes across the state except for its overlap with Interstate 465. The highway crosses into Indiana east of Danville, Illinois to Crawfordsville and Brownsburg before reaching the Indianapolis beltway, following the routing of U.S. 136. Originally the highway was expected to go through Indianapolis, but it was routed around Interstate 465 instead. Southeast of Indy, the interstate is multiplexed with U.S. 421 through Shelbyville before splitting off at Greensburg. East of Greensburg the interstate heads east along Indiana 46 out toward Cincinnati where it multiplexes with U.S. 52 before crossing the Ohio border. Interstate 74 used to merge with Interstate 465 at a freeway stub on the west side of Indianapolis at Speedway. The stub was constructed with the idea that Interstate 74 was to continue through the city. Accelerate 465 construction reconfigured the original full cloverleaf interchange between Interstate 74, Interstate 465, and Crawfordsville Road (U.S. 136 west) in 2011-12. Work eliminated the freeway stub to Crawfordsville Road, added new ramps with U.S. 136 to the south, and replaced loop ramps between I-74/465 with directional ramps. Pictured here was the original loop ramp from the westbound freeway stub onto the Beltway south. This loop was removed with the stub in 2011. Photo taken 11/05/09. A historical look at the freeway stub of Interstate 74 leading east from the Indianapolis Beltway to Crawfordsville Road (former U.S. 136). A new directional ramp replaces the loop ramp pictured here between I-74 east and Interstate 465 north. Photo taken 11/05/09. SR 9 northbound at the loop ramp to Indianapolis. Note the error SR 421 shield posted for U.S. 421. Southbound signage from SR 9 also incorrectly displayed SR 421 in place of U.S. 421. Photo taken 11/04/11. London Road (County Road 700 West) sees a loop ramp onto Interstate 74 & U.S. 421 west. 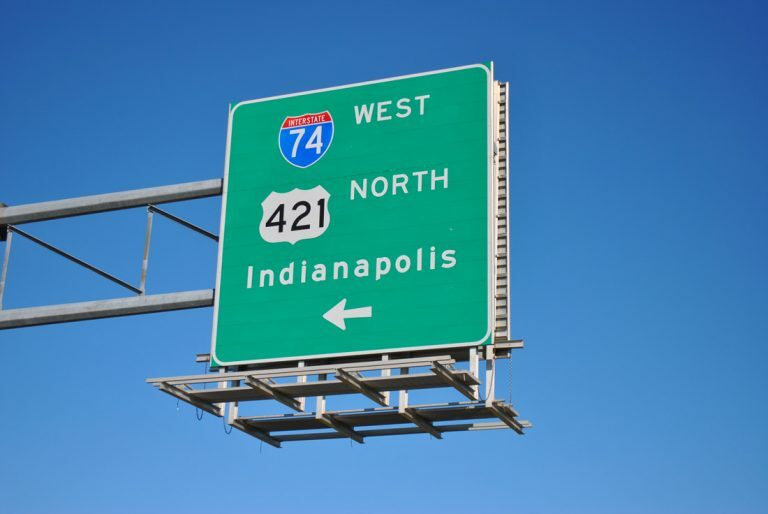 U.S. 421 combines with Interstate 74 from Exit 132 west to the Indianapolis Beltway. While the overlap is well signed along I-74, U.S. 421 is vastly ignored along the Indianapolis Beltway. Photo taken 11/04/11. Post Road northbound passes over Interstate 74 & U.S. 421 to connect the freeway with the Wanamaker community in southeast Indianapolis. Photo taken 11/04/11. Stringtown Road connects 11th Street in Covington with Interstate 74. Pictured here is the southbound approach to the diamond interchange (Exit 8) with I-74. Photo taken 11/04/11. Interstate 74 crosses the Wabash River west from Covington en route to Danville, Illinois. Peoria is used as the westbound control city for the freeway from Indianapolis westward. Photo taken 11/04/11. Stringtown Road south at the eastbound on-ramp to Crawfordsville and Indianapolis. Stringtown Road continues south to become a part of Indiana 32 near Coal Creek. Photo taken 11/04/11. Interstate 74 shield assembly posted along Stringtown Road northbound. Photo taken 11/04/11. Crawfordsville lies 28 miles to the east from Stringtown Road and Exit 8. Interstate 74 joins I-465 at Indianapolis in 65 miles. Photo taken 11/04/11. An overhead assembly directs motorists from Stringtown Road northbound onto Interstate 74 west to Danville, Urbana and Champaign, Illinois. Peoria, the control city, is 135 miles to the west. Photo taken 11/04/11. Stringtown Road continues north to become 11th Street in the town of Covington. Interstate 74 spans the Wabash River into northern Vermillion County nearby. Photo taken 11/04/11. The only state-named shield for Interstate 74 AARoads could find... Photo taken 11/04/11. An Interstate 74 shield accompanies this marker for Indiana 46 in Batesville along Indiana 229. I-74 follows the route of Indiana 46 from near West Harrison at U.S. 52 west to Greensburg. Photo taken 03/19/12. Looking north on the Indiana 3 expressway on the north side of Greensburg, where Interstate 74 meets at a cloverleaf interchange. Greensburg is the unofficial halfway point between Indianapolis and Cincinnati along I-74. Photo taken 12/18/11. Looking south on Overpass Road at the parclo interchange with Interstate 74 & U.S. 421 north. U.S. 421 heads south from this interchange to Michigan Road en route to the city of Greensburg. Overpass Road begins and ends at Old U.S. 421 (Michigan Road), serving truck traffic to the new Honda plant. Photo taken 03/10/10.